I will use the idea of the Annus Mirabilis, not at all to suggest my year was as important as Einstein’s contributions, but to celebrate a good reading year for me, the inconstant reader. I’ve read approximately a book a month which was close to my goal for this year. (I feel like one of those elementary kids who signs on to a reading competition over the summer.) This "exercise" was to first, read more, second, to read outside of my comfort zone, and third, to finish reading a whole book (ok, I failed on this one, but for good reason). Reacquainting myself to books is harder than it should be. My job has me in front of a computer screen most of the time and shutting off that screen and picking up a book is not easy. Reading a physical book has a whole different feel than reading the same words on a screen. Don’t know why, but it does. The book I’m ending the year on is James Joyce’s The Portrait of an Artist as a Young Man and it’s a bit of a slog for me. I really want to like this book but 170+ pages I’m not sure where I stand. It will be a miraculous year if I can finish this book by the 31st - that’s when it’s due back to the library. Mystery solved. About 2 months ago I heard one of those little music interludes on NPR that sound intriguing – if you are an NPR listener you know what I’m talking. So I went on the NPR site and tried to look up the details of the clip. Usually the NPR site provides all the info about these music clips but not in this case. Well that 15 second sound clip haunted me for months. Was that Badly Drawn Boy? Ben Folds? I just couldn’t figure it out. Then today it came to me. 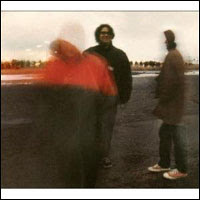 It was Yo La Tengo’s Georgia vs. You La Tengo (listen) from their Summer Sun album. Thank you, there is a Santa Claus. The movie to see this season for blockbuster-loving, technology wonks is James Cameron’s Avatar. We caught a late showing of the movie and really enjoyed it. The movie highlights the distinction between a film and the experience around a film. In this case the experience starts with the pre-release build up of the film: over 15 years in the making by a hugely successful and idiosyncratic screenwriter, film director and producer using groundbreaking technology to realize the film. When you arrive at the movie, sit back, relax and put on a pair of 3-D glasses so continues the experience. It’s an interesting mix of live-action performances and computer-generated effects. The motion-capture system used to create the film allows the facial expressions of actors to be captured as a virtual camera system enables them to see what their computer-generated counterparts will be seeing. It works well. The weakest aspect of the movie is the plot, being a little on the hokey side. In a nutshell, humans in the year 2154 arrive to a planet called Pandora to strip mine a mineral known as unobtanium which is very valuable. The problem is that the native population, the Nav'vi, has homelands right over the richest deposit of the mineral. Can you see where this is going? Begin huge conflict starring a tug of war between a ruthless corporation, ex-marines and scientists hired by the corporation, and the Na'vi. 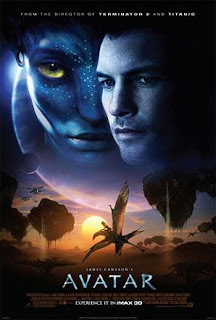 The Na'vi are 10 foot tall, blue-skinned sapient humanoids. The titular “avatar” refers to the remotely controlled, genetically-engineered native bodies that humans “slip into” to befriend the natives. Talking about experience, it’s completely appropriate that we saw the movie at Gold Class Cinemas in Redmond. Wow, what a great movie experience. It's a bit pricey but if you see only a few movies a year, do movies this way. Plush seats that recline, drinks (full bar) and snacks (e.g. lobster rolls) brought to your seat to name a few of the niceties of the experience. Need something during the movie, there is a little call button you can use to summon a waiter. The best part was there are only 40 seats or so and every seat is a good one. There was no head to look around. Ahh, that's an experience. Seattle’s own Space Travel Supply store! We did a double take waiting at the corner of 85th and Greenwood in Seattle when we saw the storefront Greenwood Space Travel Supply. What!? So we went in for a look. Inside there are science-themed gifts for young and old. In the back of the small store there is the Atomic Teleporter. One Travelmarx stepped inside and then disappeared. Okay he stepped to the other side which is a writing center. The writing center is connected to the store. The store is part of the 826 National which is a nonprofit tutoring, writing, and publishing organization with locations in seven cities across the country. The organization helps students ages six to eighteen on their writing skills. The stores fronting the different chapters differ in themes (e.g. space travel, pirate, superhero, or robot supplies). When the founders Dave Eggers and Ninive Clements Calegari first opened the storefront of the first 826 location, Valencia, the location was zoned commercial and needed to sell something to open so the pirate store was born. All subsequent stores adopted different themes. So if you are in the Greenwood area, drop by or online donate here. 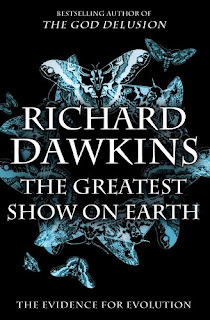 Richard Dawkins’ latest book The Greatest Show on Earth: the Evidence for Evolution is a great read. If you don’t believe in evolution (Dawkins would call you a ‘history-denier’) the book won’t be of interest to you. If you believe in evolution and want to go deeper into the subject, want to know more about examples of evolution in everyday life and a load of other interesting facts (does a whale have hind legs? ), then this book is for you. - Chapter 8, You Did it Yourself in Nine Months, is about embryology with the main take away that DNA is not a ‘blueprint’ for building the body. Blueprints are reversible and are 1-to-1 where DNA-to-final-body is not. A better analogy is a recipe. - In the same chapter, the roundworm Caenorhabditis elegans is discussed. In this discussion Dawkins gives a simple overview of how from the original egg you get a newly hatched larva of 558 cells. The key to it (and similarly in the human egg cell) is asymmetric cell division. The original cell has a front and rear end so that when it divides they go on to form (like a recipe) the front and rear of the worm. - Chapter 13, There is Grandeur in this View of Life, has a section talking about what Dawkins calls the four ‘memories’ or ways in which information from the past is recorded for future use. The memories include the gene pool, the immune system, the nervous system, and culture. The four memories are all made possible by the Darwinian process of non-random DNA survival. 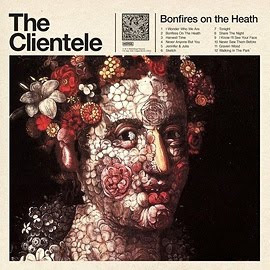 I can’t get enough of the latest Clientele album Bonfires on the Heath. What’s not to like about this album? First, the title, I’ve never seen a bonfire on the heath, but it sounds interesting. Second, the excellent cover art by the Italian painter Giuseppe Arcimboldo (1527 – 1593) – best known for his portraits made of fruits, vegetables, flowers, and other everyday objects. Finally of course, the music described as “autumnal and very English” is right up my alley. Take a listen. Kind of like pop/rock nocturnes – one of my favorite musical forms. The lyrics of the Clientele can be summed up as bones, wind, evening, voices, woods, windows, sleep, and heath. Shiver (with excitement). 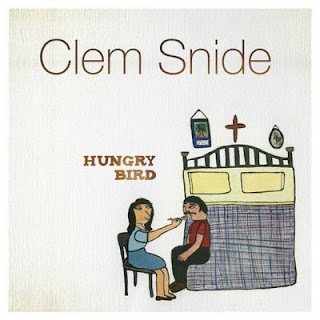 The second album I’m really digging lately is Clem Snide’s Hungry Bird. More melancholy (did I not mention that for the Clientele?) and bittersweet stories, this time of American love and life. Check out the story in the song Born a Man where a beauty queen is chased through a field when they found out she was born a man. 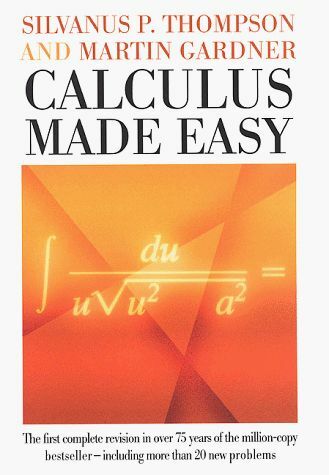 In Calculus Made Easy, Chapter 14 is titled On True Compound Interest and the Law of Organic Growth. In this chapter – quoted above- the idea of where e comes from is motivated by considering simple compound interest problems. In a nutshell, the general compound interest formula can be written as FV = PV (1 + 1/n)^n where a future value (FV) of a present value (PV) is related to the number of compounding operations (n). As n goes to infinity, (1 + 1/n)^n goes to the value e. It was the first time I considered how the value of e has a physical interpretation. 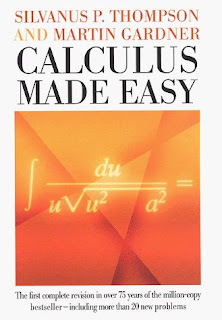 Also, while reading the part of Calculus Made Easy about derivatives something clicked and made sense about a bad experience I had with calculus while I was an undergraduate. Back 100 years ago I was taking an advanced calculus course and all we talked about were deltas and epsilons and taking limits. I remember being very lost. That’s the rigorous approach to derivatives developed by Karl Weierstrass (1815-1897) in the mid-nineteenth century. Before that, the approach used was something called infinitesimals – which is the approach taken by Thompson for motivating the concept of a derivative. It makes more sense to me and I wish I knew this all those years ago. (I could have been a very different person by now.) Infinitesimals were resurrected in the 1960s and today are called non-standard analysis. I’ve been running Windows 7 for over a week now on my laptop and I’m really happy with it. It is much better than Vista. My gold standard – for better or for worse – is that now my laptop can sleep and wake up properly. Hooray. 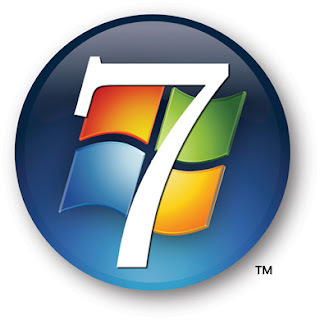 I feel like I’m more productive with Windows 7 because I’m not fighting the operating system and getting mad about frozen programs or strange behavior. WIN + Up Arrow = Maximize the active window. WIN + Down Arrow = Minimize or restore the active window. WIN + Space bar = Make all windows transparent, maybe you have a pretty background picture? Here’s the scenario: 90+ cassettes of music from 1987-2001 that contain music I wrote, both instrumentals and songs with friends singing, 1 failing Nakamichi BX-2 tape deck (reverse doesn’t work), and angst that if I don’t capture what’s on those cassettes now it will get harder and harder. Sound familiar? Old media that you put off doing anything with. We’ll I buckled down and hooked up the tape deck into the back of the computer and just started recording (using Sound Recorder in Vista). I ended up with 50+ tapes ripped. The rest, I determined where not important. Sometimes I stopped and started the Sound Recorder and captured (to .wma) individual songs and sometimes I just recorded a whole side of the cassette as one digital file leaving it for a later project to extract out individual pieces. The Sound Recorder tool in Vista and a generic audio card was fine for this project because the quality of the tapes was not really that good to start with. The conversion took about 3 weeks. Now I’m storing the box of remaining cassettes for 1 month and if I haven’t gone back to it, out it goes. And the tape deck is going to Goodwill. o Create less to begin with. Note the pain you are experiencing during the conversion and let it guide what you create now that you’ll be wrestling with in the future. o Label and date as you go along. It’s frustrating to try to make a decision later, perhaps years later, on something as whether to save or toss it if there is no date or context. o Keep your media organized, you’ll thank yourself later. This includes items already on the computer too. Use well defined folders and names. o Convert media when the time is right. It’s okay to hang on to some personal media/artifacts for a while until you find the right format to convert it into. o Consider if you really need what you are converting. Are you really going to miss it? Can you buy it again? Maybe the cost of buying it is less than your time to convert it? o Sometimes, taking a picture of all the items together as a keepsake is as effective as converting it over and having it sit around in a new format, never to be used. I think that sometimes people just want to remember what it is they had, but they don’t want to use it or play it. o Consider scanning (with a scanner) objects that may not seem so obvious to scan. In this cassette-conversion project I scanned the cassette inserts (or the whole cassette if it didn’t have an insert) because what I wrote on the inserts or directly on the cassettes is how I visually remember the tapes. The color ofthe cassettes without inserts is important to my memory of them. Fortunately, this translates well to the computer because say in Windows you can name your scanned item “Folder.jpg” and then when viewing your folder, the scanned images becomes the folder’s icon, almost like a virtual cassette. o Keep notes on how you are doing the conversion. You may stop and pick it up later and the notes will be indispensable. o Consider keeping notes on what you don’t archive as well which could be just as interesting. o Don’t, if you can help it, skimp on storage. Storage always gets cheaper so don’t make some decision during conversion time to save a little space if it means a huge compromise in the quality or how you’ll enjoy the media later. We’ve heard about the labyrinth at St. Paul’s Episcopal Church (50 Roy St.) for many years. In my mind labyrinth translates to a hedge maze like the Hampton Court Maze. The labyrinth in my mind is a cool, mysterious place with tall walls of foliage and the possibility of getting lost. The definition of labyrinth is a series of passages in which it is difficult to find one’s way. Well, the labyrinth at St Paul’s - as witnessed by the photo above – is not quite somewhere you are going to get easily lost, at least physically. Actually, the St Paul’s labyrinth is a type of labyrinth that has a long and interesting history itself. It is a type of labyrinth that has an unambiguous route to the center; you are not supposed to get lost physically but in your thoughts. In Greek mythology, the labyrinth was the maze-like structure built by Daedalus for King Minos of Crete to hold the half man, half bull Minotaur creature. The Athenian hero Theseus killed the Minotaur and found his way back out by following thread he laid out. Travelmarx is in Los Gatos and had a hankering for a meat sandwich so we stopped by the Los Gatos Meats & Smokehouse for a sandwich after one and a half hours of serene sweating at Yoga Source. A delicious reward. If you are in the area this is a great place to grab a sandwich. We had a Smokehouse Signature JJ Special which was slow smoked, pulled pork w/ BBQ sauce. The last thought is interesting and should be followed up using the very same methods Sagan is proposing in the book, methods he calls the Baloney Detection Kit. The kit is in some ways the centerpiece of the book. It is a checklist for evaluating a claim to knowledge. (For example, a claim that aliens built the pyramids. One would use the kit to evaluate that claim.) The checklist items are quite accessible and easy to read and provide a good filtering apparatus for evaluating all ideas or positions that you might encounter. The kit also includes a list of common fallacies in logic and rhetoric that you might encounter in applying the aforementioned list of points with someone who holds a claim you are evaluating. Here’s a video summary of the idea of the Baloney Detection Kit – though this summary has slightly different points – that gives a pretty good idea of what it’s about. 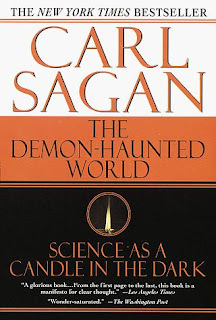 Since Sagan is a science popularizer the book may seem lightweight to those looking for some more substance. At times Sagan seems dreamy-eyed with the prose. But the story he tells, the relevancy of the topic, and his sincerity for the subject keep the dreamy aspect from dominating too much. I especially liked the fact that Sagan used stories from the lives of historical figures like Frederick Douglass, James Clerk Maxwell, Sir Isaac Newton, and William Blake, to name a few, to make his points. I cannot decide whether to believe this or not. This was from a recruiter that I had to beg to get any information from so it feels lame. A day after the interview I wrote an email thanking the recruiter and the team that interviewed me. The recruiter responded immediately and said that they would make a decision in a day or so. Fast forward two weeks and still no word so I decide to send a polite note asking for status. I got an instant email reply that implied I would get a call that very afternoon. I waited but no call came in. Six days later and still nothing, so I sent another email saying that I now had another job offer and would like to know where I stood. (The new offer was not a threat but true.) That’s when I received the statement above. Boy, nothing like setting expectations. I’m okay to not be qualified for a position, but I would like to know where I stand so I can move on. This was also from a recruiter who waxed glowingly that in the company I was interviewing for (and that the recruiter works for), how you do something is just important as why. Oh, I see now. Well, at least better than other spam email because Russian-language spam is amenable to filtering. In Outlook I just set a few rules to watch for a few common Cyrillic characters. For example, this character: Д in the subject seems common and so I filter on that. (I guess it translates to a “D” or “delta”.) I also throw anything from the mail.ru domain away. Think of all the deals I’m missing. These spiders hang head down in their webs waiting for prey. These and other spiders start their webs using a technique called “kiting” where a thread of silk is left to blow in the wind until it contacts an object like a branch. Some other tidbits about the European garden spiders. 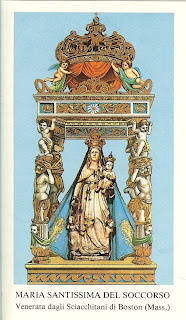 The specific epithet (diadematus) means crowned; wearing a diadem; adorned. And, this spider has had it's own movie, a short documentary called Epeira diadema (1952) by Italian director Alberto Ancilotto (1903 - 1971). Here's a short biography in Italian. For more pictures of A. diadematus and other spiders in this genus, see European orb-weavers at Spiders of NW-Europe. Thank you diadematus for your service this year and hope to see your young ones next year. People in Vegas are misshapen, dressed in all sorts of wacky outfits, and are wrinkled in the hard-knocks-kind-of-way, not in the sagely-nice-kind-of-way. Furthermore, people who travel there seem to throw any decorum to the wind and behave like idiots. Have you ever been on a plane bound for Vegas where the rowdiness started before even leaving your starting point? As if frumpy, misshapen people are not enough, they arrange themselves in front of video machines, pulling a lever with one hand with a big drink of some kind in the other and all the while wearing a vacant and vaguely dissatisfied look on their faces, losing money. Oh humanity and the misunderstanding of probability theory. Travelling around Vegas proper is all endless concrete highway and pavement, crushed stone, cookie cutter residential condo units with names like they want you to believe you are somewhere else (Italy? ): the Tuscany, Tremezzo or Bella Fiore (should be bel fiore technically ?). There are the more honest and descriptive complexes with names like Ridge View or Whitney Ranch but they are still cookie-cutters. Driving around you get the feeling of isolation. Outside of the strip and downtown we hardly saw people using sidewalks or engaged with the community. It’s best experienced from the privacy and comfort of your car at 50 mph. You learn quickly which parking lots connect to each other so you can avoid an eight lane road here or a divided highway there that you can’t easily get across. There is endless retail: lots of dentistry, video poker and bad food. 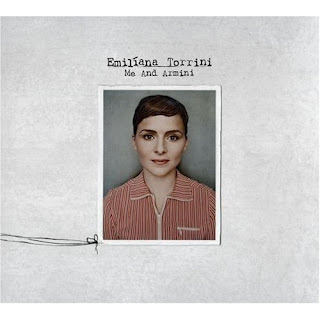 We just got our hands on the now one-year old album from the fabulous Emiliana Torrini called Me and Armini. From start to finish, we can’t find anything bad to say about it. Some videos from the album: Jungle Drum, Big Jumps, Me and Armini. Torrini’s album before this, Fisherman’s Women (2005), was very good as well. Torrini was the voice on Gollum’s Song (video) from the Lord of the Rings: The Two Towers soundtrack. 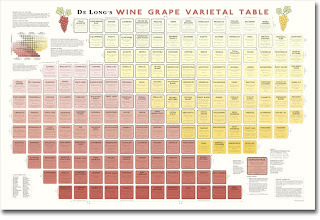 De Long’s Grape Varietal Table, But For Software Technology? Whenever we go to pick up the latest arrival at Garagiste, I can’t help but sneak a peek at their De Long’s Wine Varietal Table. The De Long’s Web site calls it a “reference disguised as a fine art print” – but the average person on the street would probably say “poster”. Nonetheless I love the attempt at presenting the information graphically and textually in an appealing way. I have no idea if it is considered useful or fluff by those in the know. After looking at the wine varietal table I started to wonder if technology – and I’m talking here software-related technology but it probably could be more generalized – could be arranged in a similar graphical way. So you could see quickly how C++ is related to C#, C# is related to F#, and F# is related to Python. Or how WCF is related to REST, REST related to SOA, and SOA related to Web 2.0. Departures: Flying – Does It Feel Like This To You? Our favorite magazine, Departures, arrived today. I can’t flip through it without finding something that stands out to me. In this case it was this ad from Cathay Pacific. An awkwardly skinny woman passenger is handed what looks like are pajamas in a deserted cabin with very spacious berths. Where is everyone? Why doesn’t flying ever feel this (wonderfully) desolate to me? There is always a child kicking the back of my seat, someone in front of me that goes to full recline mode, and a mouth breather next to me. The text reads “What I loved were the little touches that made me feel so cared for.” Well if you are the only passenger and that flight attendant is feeling lonely too on that deserted plane, of course you’ll bond. Oh, how far we have fallen. 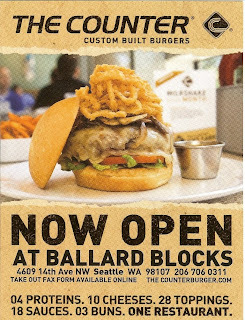 At one time we would be able to write something about a restaurant in Florence and now it’s just The Counter in Ballard - a new eatery at the Ballard Blocks. We thought we’d try it after a light workout at LA Fitness just next door. Without knowing anything about it we walked in with no biases. Upon stepping in you are given a clipboard by one of the 200 (I’m kidding but there were a lot) of the wait staff. With the clipboard and a pencil you pick from dozens of items in a few different categories to build your own customized burger. They claim over 312,120+ combinations are possible. (We are not sure how they arrived at that number; we tried different ways to calculate it. Here’s the menu. Give it a try.) Anyhow, we ordered – nothing too crazy – had some fries and were not overly impressed. Quality-wise it was okay, not great. More choice is not necessarily better. The burgers were too big to even get into our mouths. (You can get a burger on a bed of lettuce which might be better.) The meat they said was going to be pink inside was gray instead. 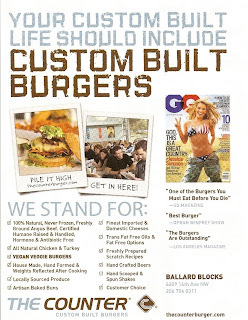 Hands down, we would recommend Blue Moon Burgers or Red Mill Burgers instead of The Counter. When we got back to our car we found the flyers shown here plastered to the windshield. If we’d had known it was chain, we probably would not have gone. If we’d had known it was endorsed by those stalwarts of common sense GQ Magazine and the Oprah Winfrey show, we definitely would not have gone. 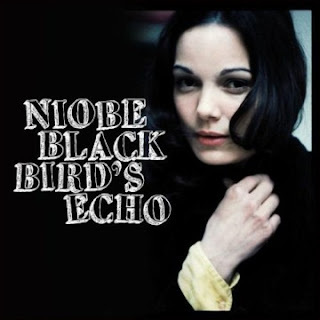 Two standout albums in the last few months for Travelmarx are, drum roll please: Niobe with Blackbird’s Echo and Wilco with Wilco. Yvonne Cornelius (aka Niobe – taken from a character in Greek mythology) has a few albums under her belt and I can't say I’ve listened to any of them. Her latest Blackbird’s Echo ended up in my lap via a friend and I was immediately taken by its quirky lyrics, vocal styling, and general art-house feel. The songs at times feel like experiments - a splice of sound here, a deconstruction there – deliberately calculated to let you experience a song in a totally different way. I think it works. Favorite track: Fever. 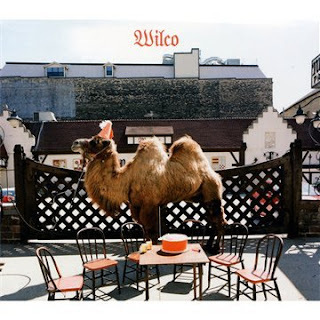 Wilco’s Wilco (The Album) is the second favorite. In this case, I’ve followed most of all of Wilco’s work so I dutifully went out and bought this without thinking much about it. I listened once or twice and it didn’t stick. Then picked up again and now it’s just as good to my ears as A Ghost is Born or Sky Blue Sky. Favorite track: Bull Black Nova. Happy listening. After hearing about the Corson Building for so long it was great to get to finally try it for a nice leisurely brunch. Apparently, the owner/chef Matt Dillon (who we didn’t see at brunch) has quite the reputation in Seattle as a cook. The Corson Building is a take (at the increasingly popular genre) supper club, communal dining experience. We are thinking of the Art of the Table that we recently went to. There were six of us and we arrived around 11 am on this beautiful, sunny Sunday. First thing you might notice is the location, slightly under a freeway overpass, near some train tracks, and under a plane route. Some might be put off; we think actually makes the experience more interesting. Not once during the meal inside did we feel like the location was a problem. Moving beyond the location, you can’t help but notice the building is not what you might be used to seeing in Seattle. Apparently, the building is about a century old and used to belong to an Italian stoneworker. It looks vaguely European. Take a few minutes to explore the gardens and spaces outside. Inside, the setting is rustic, communal, and comfortable. On this particular Sunday it wasn’t at all crowded so we had a table to ourselves. I think that this is not at all like the dinners from what we can tell, so we may not have had a “typical” experience. The food: very good, but we can’t say the flavors or the presentation was over-the-top or the best we’ve had, but it was definitely very, very good. Staff was attentive and friendly. We would love to back and try dinner there. We took a bike ride from Fremont to Marymoor (going around the north end of Lake Washington) and back. We were frustrated that there wasn’t an obvious path around Lake Washington so that we could come across I-90 to make a loop. All in all, the 55 miles (roundtrip) ride was nice. We had a so-so lunch at the Redhook brewery, just a one minute diversion off of the Sammamish River Trail. (The Herb Farm pratically shares a parking lot with Redhook– now that might have been more interesting…). The only sort of trick part was the leaving the Burke Gilman Trail and connecting to the Sammamish River Trail. At Blyth Park, instead of going left, we went straight over a bridge (into Blyth Park) and that takes you somewhere else. Stay on the west side of the river! Once, we got on the Sammamish River Trail we found it to be very nice, in some ways nicer than the Burke-Gilman. If you get a flat in Bothell (like one of us did), Bothell Ski & Bike is a few hundred feet off the trail near NE 180th St and can assist. 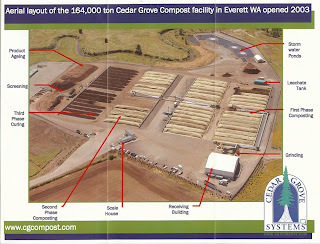 We both had the opportunity recently to visit the Cedar Grove compost facility in Everett Washington late last month and were impressed. Besides exciting our geek circuitry, it just made us feel good that green waste (organic matter) is being kept out of landfills and being recycled into a useful product – compost. 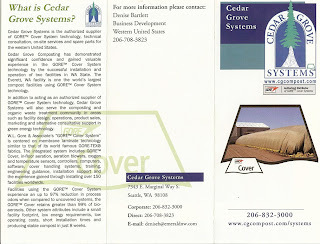 The facility uses a system called the GORE™ Cover System which so simple and elegant. Basically, incoming green waste is ground up and then put in piles under a cover similar to what is used in GORE-TEX® fabrics. Once covered, air is introduced as needed and the green waste starts breaking down. The covered compost piles can reach temperatures up to 170 degrees Fahrenheit removing pathogens and weed seed. A usable compost can produced in just two months, though in practice compost is aged longer. Walking around the piles of compost in various stages of completeness you notice non- or not-easily composted items that inadvertently got mixed into the waste. Metal is separated early in the process, but other items like plastic can make it through the process remarkably intact. These items are of course screened out before the compost is bagged. One such item was a pack of father’s day cards pictured below. 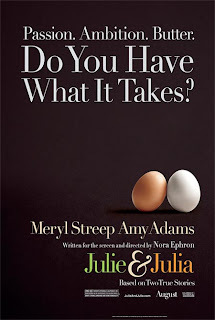 Last night we went and saw the movie Julie & Julia (2009), a comedy-drama about the parallel lives of Julia Child (1912 – 2004) in the early years of her career in the 1950s and young New York woman, Julie Powell (1974 - ), in the early 2000s. Both women are trying to figure out what they’ll do in life, how they will make a difference. The connection between the women is underscored by Powell’s 2002 documented effort to cook all 524 recipes from Child’s Mastering the Art of French Cooking (1961) in one year (she does). The good points of the movie (getting on a soapbox here): no violence except for the boiling of lobsters and the boning of a duck. Also, the movie is a food lover’s paradise of kitchen, dinner, and food scenes. Okay we’ll grant you that some scenes like Julia arriving in France and coming into her new apartment with her husband Paul might be a bit over-romanticized but it worked for us. Mastering the Art of French cooking was first published in 1961 and was authored by Julia Child, Simone Beck and Louisette Bertholle. The cookbook was aimed at making French cooking accessible to the American cook. The foreword to the book sets out the goal: “This is a book for the servantless American cook who can be unconcerned on occasion with budgets, waistlines, time schedules, children’s meals, the parent-chauffeur-den-mother syndrome, or anything else which might interfere with the enjoyment of producing something wonderful to eat.” In 1962 Julia Child began her first cooking show on WGBH in Boston and the rest is history. One aspect of Julia Child’s life that I left the movie with more of an appreciation of was her marriage with Paul Child (1902 - 1994). It seems they successfully combined friendship, partnership, and love seamlessly in their relationship. 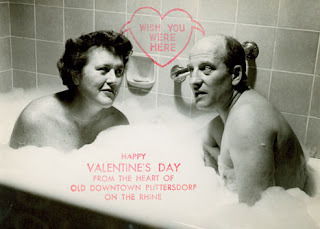 In the movie, there is a scene showing Julia and Paul posing for one of their infamous Valentine’s Card they sent to friends and family in 1956 of them in a bathtub. 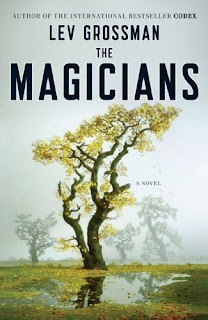 I wanted to like The Magicians more than I did, really. This new Harry-Potter-for-adults book by Lev Grossman has its interesting points for sure, and I eagerly read it cover to cover. However, I just didn’t like the main character, Quentin, that much. Worse, I didn’t find his actions at certain points of the story believable – even for a teenager/young adult. The idea that Grossman returns to often is that “real” magic is hard and very tedious to master. Furthermore, there is usually no all-powerful evil villain (aka Voldemort) that is the center of everyone’s attention and has everyone on red alert. So, without giving too much away, Quentin discovers he is more than just a magician in the vein of fancy card tricks; he goes on to formal training to become a real magician and discovers just how tedious it can be. This is all fine and good, but Quentin just wallows way too much to be believable. At one point, Quentin and magician friends stumble into a parallel world (you’ll have to read it) and instead of being awestruck Quentin mopes around pouting about his girlfriend. It strains credibility. On a related note, I thought the recent Harry Potter movie (Half Blood Prince was it?) was a bit of a snooze. The only thing that really caught me attention was when Dumbledore used the word maudlin or mawkish (very similar anyways) during one of the scenes. As a word choice it seemed so out of place with all the other dialog. We’ve wanted to try the Art of the Table restaurant in Wallingford/Fremont for some time now and today was our lucky day. We called in the morning and were able to get a 4 person table for the evening. The meal and evening did not disappoint. First, we’ll say it’s not exactly communal dining – the term supper club is a bit closer to the experience. There was one shared table this evening and the rest were spots for 2 or 4 people. However, this is a quibble, because it is more than enough intimate and there is ample opportunity to talk to your fellow dinners if you choose too. You are encouraged to get up and take a breather between courses and you’ll probably run into your fellow diners, maybe even in the tiny garden just off the kitchen. The real star at the Art of Table are the preparations of fresh, local ingredients that the chef Dustin Ronspies whips up and then describes just before you dig in. Dustin is endearing as a host and his love of the food and sharing of that food with people is evident and infectious. Everything we ate this evening (see menu) was delicious. Special mention goes to a palate cleanser of summer carrot granita had us guessing everything but carrot as the main ingredient. We did the wine tasting flight (4 glasses) and were pleased with the pairing. If only every evening were like this! As part of our short stay in Boston, we visited the John F. Kennedy Library on Monday morning. This was the first presidential library either of us has been to so we didn’t know what to expect. There are just under 20 presidential libraries. Over half are administered by the National Archives and Records Administration (NARA) and the rest are operated by private foundations, societies, or state governments. The JFK Library is just a few minutes outside of Boston on Columbia Point next to the rather lonely-looking University of Massachusetts. 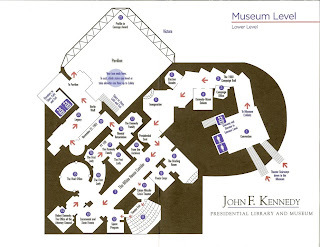 The JFK Library was designed by I.M. Pei and looks a heck of a lot like the University of Rochester’s Wilson Commons. The one thing that struck us the most was the part of the exhibit dealing with the campaign for the presidency and the battle between Nixon and JFK. There was an eerie “sameness” to the talking points between left/right used then and what is used today. (Note, the library didn’t really portray one candidate in a better light – but just gave the facts.) Just listening to clips of the debates and reading the campaign material you can’t help but get the impression that with minor word choices the same talking points could be used today. Oh, wait, they probably are. By accident we stumbled on to this Boston, North End, Italian festival called the Fisherman’s Feast held in honor of the Madonna del Soccorso di Sciacca. We had just finished eating at Taranta (a self-described Italian – Peruvian marriage of food) and were feeling very happy with our restaurant choice when we followed the noise and caught part of the festival. The festival has its roots in Sciacca Sicily dating back centuries. Since 1911, the festival has been celebrated in the North End by immigrants and their descendants from Sciacca every August. The Madonna del Soccorso (translated as “Our Lady of Help”) has its roots in a miraculous recovery of an Augustinian monk in the year 1300. The Madonna visited him and he was healed. That was Nicolo Bruno. Being in the midst of the festival with the smell of delicious food (even after just finished eating), listening to Italian being spoken, and feeling the party atmosphere was a good way to cap off the our only full day in Boston. The last night of the feast features an angel descending from a window to bless the Madonna. Past angel-flights can be found on You Tube. Isabella Stewart Gardner (1840-1924) was an American art collector, philanthropist, and patron of the arts. 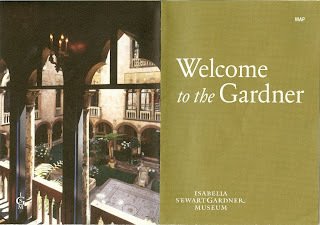 Gardner’s collection, which began in earnest in 1891 and is housed at the Isabella Stewart Gardner Museum, first opened to the public in 1903. The museum, designed by Gardner, was inspired by the design of Palazzo Barbaro in Venice where she regularly spent time. In fact, it was fun to walk into the museum, see that spectacular central courtyard and the layout of the rooms and feel transported back to Italy for a little while. The famous John Singer Sargent portrait (pictured above) of her hangs in the Gothic gallery on the third floor. It is one of two pieces of artwork in that gallery that are not gothic. The audio guide suggested a quasi-religious aspect to the painting with what almost looks like halos around here that is somehow in keeping with the theme of the room. Or maybe since this is the last room on the “tour” she is simple saying goodbye? The arrangement of the galleries and eclectic mix of artwork was stipulated by Gardner in her will so we are seeing, I’m guessing, the collection close to the way she would have wanted it to be seen. This includes several rather large and empty frames in the Dutch Room that used to contain paintings by Rembrandt and Vermeer that were stolen in 1990. The paintings were never recovered but the frames were kept where they are partly to honor Gardner's stipulation and partly to raise awareness in the viewer. Keep alert, because there is a reward for information leading to the return of the stolen art. When visiting the museum, Travelmarx suggests that you invest in the audio guide if you have no idea who Gardner was or what the museum is about. It is well worth it and it will slow you down so you can truly enjoy the museum spaces. We had two 1 full day and part of another day in Boston and the Freedom Trail was the top tourist attraction for us. Why? I guess I had incomplete memories of it having visited it in elementary school and I wanted to remedy that. In fact the only thing I can remember are the shops in Faneuil Hall. Nothing else. Was it worth it this time? Yes. The Freedom Trail is a 2.5 mile walk from Boston Common to Bunker Hill Monument (across the river in Charleston). We walked it slowly in about 3 hours stopping for a quick lunch – at an Italian street fair nonetheless. The trail starts out busy (around the Visitor Center in the Common) and comes to peak in the food court of Quincy Market. After that visitors at least following the red brick (or painted) line seem to lessen. 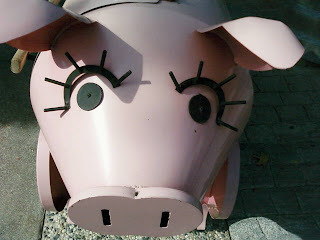 When the Trail crossed over the big dig into the North End it suddenly felt more interesting for us: food-wise (Italian! ), crowd-wise (less people), and architecturally (interesting and human-scaled buildings). We skipped the USS Constitution in order to fit in the Isabella Stewart Gardner museum. Bunker Hill Monument was more interesting than we expected. It is a refreshing place to sit and relax after walking the trail and climbing the 294 steps to the top of the monument. Admission to the monument is free. The Freedom Trail Foundation Web site is worth checking out before visiting and there is a map you can download. Audio guides can be found here and here. On a Saturday afternoon a few weeks ago we rode Seattle’s new Light Rail service from downtown to (almost) the airport. To sum it up, it was nice, clean and seemingly efficient, but I don’t think as a long term resident of the Fremont neighborhood we will ride it regularly or even infrequently to airport unless the price of getting there by other means rises a lot. We just live in the wrong neighborhood. Anyone living in a stone’s-throw-from-Seattle-neighborhood but off the north-south axis of all the major transportation routes in Seattle is probably in the same boat. Taking a connection to downtown Seattle to pick up the rail service doesn’t make much sense unless you have plenty of time and want to get to the airport for under 10 dollars. When the rail service extends further north, then it will be become more compelling for people living significantly north of Seattle. There are good things about the rail service, even if we won’t use it: 1. People can park at the Tukwila station and take the train into downtown Seattle which is convenient and gets cars off the road. 2. The stations are reasonably attractively and intuitively designed. 3. People coming to Seattle for business or a conference in downtown Seattle are going to love the train (when the last leg opens between the Tukwila station and the airport). So we only had one hour, but at least we got to see it: the California Academy of Sciences. We had just enough time to take in the Rainforests of the World exhibit and the Living Roof exhibit. The dome that houses the rainforest is interesting but surprising bare of plants. I was expecting more of a greenhouse feel with abundant foliage and that wasn’t the case. The exhibits and information provided were great, just that I sensed more concrete and glass than foliage. The last part of the rainforest is the Amazonian flooded forest and that was interesting. The Living Roof was the highlight for us. It’s still pretty new, just about one year old this month but it looked great. It makes you ask why more buildings aren’t doing this. Yeah, I’m sure cost is a huge driver…but aesthetics should trump that, right? There are docents up on the Living Roof to explain how the roof is put together so make sure to ask them lots of questions.